Enter NVIDIA G-SYNC, which eliminates screen tearing, VSync input lag, and stutter. To achieve this feat, we build a G-SYNC module into monitors, allowing G-SYNC to synchronize the monitor to the output of the GPU, instead of the GPU to the monitor, resulting in a tear-free, faster, smoother experience that redefines gaming..
Tim Sweeney, creator of Epic’s industry-dominating Unreal Engine, called G-SYNC “the biggest leap forward in gaming monitors since we went from standard definition to high-def.” He added, “If you care about gaming, G-SYNC is going to make a huge difference in the experience.” The legendary John Carmack, architect of id Software’s engine, was similarly excited, saying “Once you play on a G-SYNC capable monitor, you’ll never go back.” Coming from a pioneer of the gaming industry, who’s also a bonafide rocket scientist, that’s high praise indeed. Tim and John are established game-engine gurus; fast approaching that status is Johan Andersson, DICE’s technical director, and architect of the Frostbite engines that power several EA titles. As a man known for pushing the boundaries of technology, we were keen to shown Johan G-SYNC. Tim, John and Johan will be speaking further about G-SYNC’s features and benefits at a press showcase today, in Montreal – stay tuned to your favorite hardware site for further quotes and info. 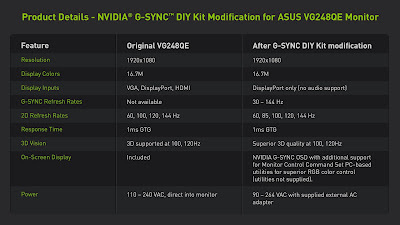 If you’re as excited by NVIDIA G-SYNC , and want to get your own G-SYNC monitor, here’s how. 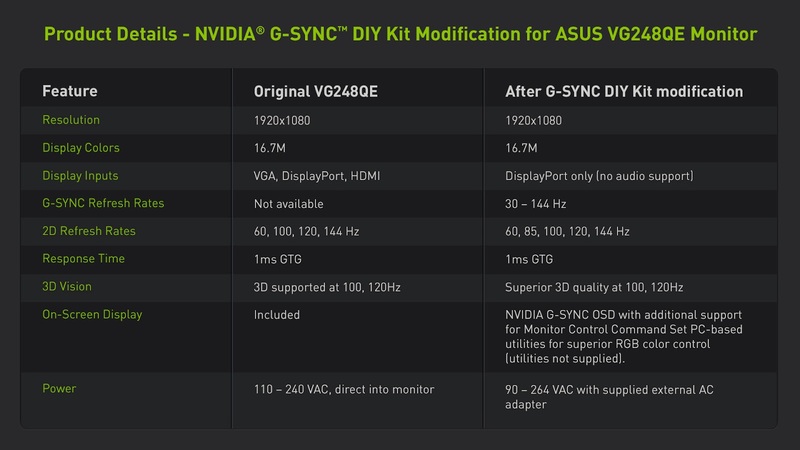 Later this year, G-SYNC modules will be winging their way to professional modders who will install G-SYNC modules into ASUS VG248QE monitors, rated by press and gamers as one of the best gaming panels available. These modded VG248QE monitors will be sold by the modding firms at a small premium to cover their costs, and a 1-year warranty will be included, covering both the monitor and the G-SYNC module, giving buyers peace of mind.